In one golden hour, you and your friends shall weave a tale none will soon forget: a tale of good-hearted puppets in a bad-hearted world. You shall rise up against the savagery of Punch the Maker-Killer with his army of Nutcrackers and his terrible Boys, sewn from the flesh of the Maker of all puppets. You shall be steadfast and true. You shall likely die trying. Your puppets are ready to take the stage. But speak softly, lest the Nutcrackers hear — and come to call with a sharp rap-rap-rapping at the door. “Tremendously fun.” — Ron Edwards (www.indie-rpgs.net). “A fascinating game.” — John Kim (www.darkshire.net). 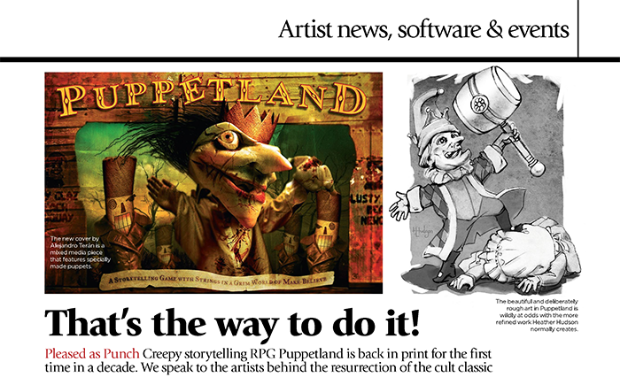 “Not only an interesting, haunting and funny adventure game about puppets but a clever exploration of the relationship between RPGs and theatre.” — James Holloway (www.rpg.net). “It makes you laugh, cry and shiver, it’s just so damn creepy.” — Derek Guder (www.rpg.net).